CK Eternity Summer 2014 for Women has been perfected by nature. 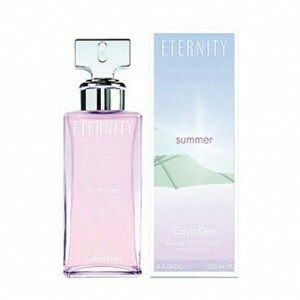 CK Eternity Summer 2014 for Women 100ml. Eau De Parfum is a new fragrance coming out in 2014. Fragrance for women belongs to the family of floral fruit. Summer fragrance is created for those who love to bask on the beach, and personifies a carefree holiday and total relaxation. The fragrance is designed for daytime use and will long to please its possessor shimmering rich bouquet. Transparent pink bottle decorated with a metal lid dosing. CK Eternity Summer 2014 for women - it is the composition of the notes of mandarin, green bamboo leaves and pears surrounded by shades of watermelon, peony flowers and water lily, gardenia, neroli, musk and light wood. Experience the limited edition Calvin Klein Eternity Summer Eau de Parfum for Women, a fragrance that’ll transport your senses to a romantic secluded beach. An opening of sea breeze accord leads to the heart of gentle wisteria flower and its white amber base. Fresh, calm and sophisticated, the Calvin Klein Eternity Summer 2013 fragrance has been perfected by nature. A gentle fresh floral that is guaranteed to be your fragrance on those long summer days and relaxing summer evenings. It is typical of summertime refreshment. Materialization of the idea of ​​relaxing on a sunny beach and endless, where you are given water intoxication, freshness and floral tones. Home fragrance consists of juicy mandarin, pear and sweet, refreshing watermelon and green bamboo leaves, which cause sparkle in your heart and a smile on his face. Heart fragrance will bring sunny wrap floral tones with which they will summer days much more intense and pleasurable. The foundation is exempt woody notes that the whole perfume composition perfectly amplify. Perfume Calvin Klein Eternity Summer 2014 will evoke peace, bliss, and blissful feeling of relaxation. Contributes to the practical and pink sequined a vial that you can feel the ease and refreshing impression. As well as the very fluid that is hidden inside.